Texas World Speedway, a gargantuan 2-mile oval on the outskirts of College Station, a college town that’s creeped so far outward it’ll soon swallow the race track entirely, may still survive through its 50th birthday. But it won’t be a happy one. It’ll be rather lonely, although the track looks like it has all the company in the world. Texas World never had an easy time. From its first sanctioned race in 1969, to its IndyCar and NASCAR days, to the more recent times when amateur racers and driving schools were the main ones renting the track, it hasn’t been the most well-trafficked or profitable venue. Texas World didn’t have the attendance numbers that its sister track Michigan International Speedway did, and all major racing series had bypassed the speedway in 1981 due to inconveniences like a two-lane highway leading into the track, an unpaved infield and the like. Michigan International Speedway is still on the modern racing schedule in NASCAR’s highest levels. For the past few years, it was a miracle each day the Texas World was still with us. A developer bought the track a decade ago, and bulldozers were expected to arrive in mid 2015 to pave over it with a 550-acre housing development. Delay after delay rolled around, keeping the track alive for a full two years after its expected closure. It began to feel like maybe the housing development would keep holding off, and the track’s hometown of College Station would find a way to grow around it rather than over it. But once Hurricane Harvey hit the Texas coast, a different kind of heavy machinery arrived at the track. The end of August was the end of Texas World Speedway’s life—or, Texas World Speedway as we all knew it. Flatbeds began rolling in, loaded with vehicles that would head to insurance auction after being handed flood titles. All motorsports events at the track were canceled from that day forward, and staff fired. Flooded cars filled up the area at astonishing rates, so meticulously parked throughout the track’s acreage that it’s hard to find a single car out of line. For weeks, flatbeds headed into the Texas World infield and straight back out to go pick up more cars from the areas hit by the hurricane about two hours away. A police officer guarded the entrance to the track, waving flatbeds by and stopping any car without a Copart company logo. The track has exponentially more flooded cars than it did when Jalopnik visited midway through September, as they now swallow the entire property. Local videographers Brazos Drones and Texomatic offered to take their drone out to capture the incredible sight, and it’s nothing short of that. 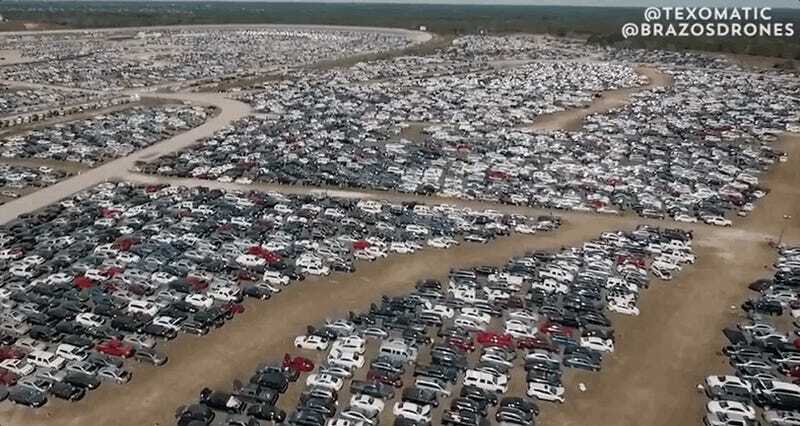 Texas World Speedway, tossed aside and left to rot just off the highway outside of a small college town that isn’t so small anymore, will spend however much time it has left in its life housing all of the cars trashed by the ocean that owners tossed aside as well. What a fitting, yet sad, way to go out.